I bought a white purse. Okay, it isn’t exactly nursing shoes white, but more accurately, a soft cream color that my kids just happen to call white. 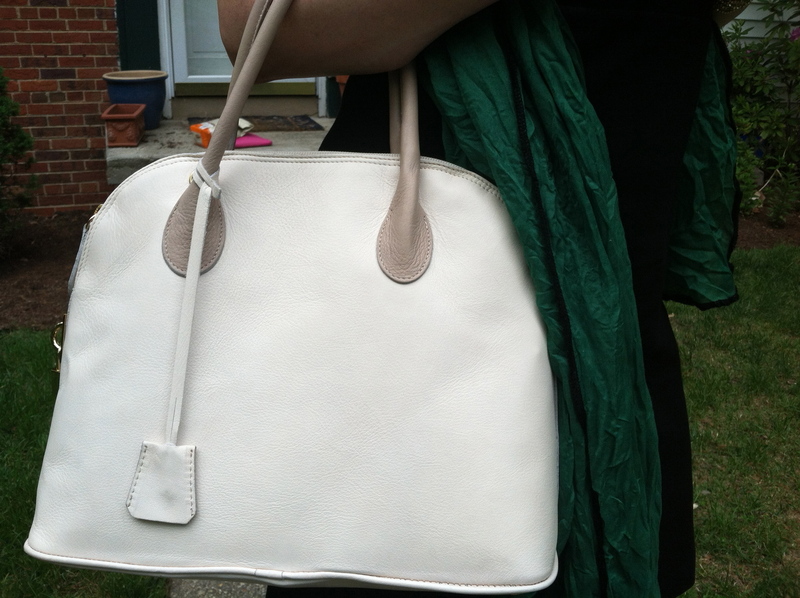 It has lovely dove-colored handles, the length of the drop on which is perfect for me and my on-the-go needs. In three weeks, I may be wondering why I went with such an unforgiving color. It’s only a matter of time before it catches the nip of my ink pen, rubs up against something sticky, or just starts to accumulate a city hue from being carried to and fro in an urban environment. But I’m going to diligently protect it from such evils because I love it. I love that it looks just as good with black as it does with my brightly colored dresses and skirts for spring and summer. I love that it works with jeans. I love that it isn’t matchy matchy with my spring and summer shoes, but it also doesn’t clash with them. And most of all, I love that it’s from the Lillybee inaugural Italian handbag line, designed by local shoe goddess Kassie Rempel. That means my purchase not only supports a dear friend, but a woman-owned, DC-based small business. On the first day I broke it out, I was mainly confined to my desk, but the three times I stepped away from the office, I received compliments on Rita. She makes a fine addition to the Lillybee family, and with any luck, maybe I can talk Kassie into offering it in eggplant for the fall.